I'll never forget the day my best friend called to tell me she had left her husband. Except she hadn't just left him, she had run away, packing a few scarce belongings in a desperate bid to leave before he could come home and stop her. I knew things had been challenging, there had even been recent police involvement and as a best friend I thought leaving seemed to be a sensible thing to do; but somehow I failed to grasp the gravity of the situation, always imagined that drama like this belonged to TV, or affected the lives of women I read about in the news. This was my best friend. How could it happen to her? I'll never forget that sense of dizzying uselessness as I listened from 1700 km away: as she related the events that led to her escape, to the calls from the shelter, to the fears that she might lose her kids, that he was following her, lying about her, hating her, as her other friends dropped away preferring the predictable tidiness of their own lives to the unraveling horror of hers. I'll never forget the confusion when her husband called me apparently desperate to fix things, to know where she was, to say how sorry he was, that she had been unstable and as much to blame, that he was worried about her. Meanwhile he was doing what he could to destroy her reputation. It is uncharted territory to walk alongside a woman as she endures and emerges from the wreck of a relationship in which there is domestic violence and abuse. What can you do? How do you help? How do you support your friend (sister, cousin...) as she rebuilds her life, her self-esteem, cares for her children, gains access to the resources that they all need? My best friend is Cathy. She posts blogs on this site and continues to amaze and inspire me as she pieces her life back together and uses her experience of domestic abuse to help other women rebuild theirs. We have talked together, wept together, feared together, rejoiced together and we'll keep on doing all of those things (even though we have not seen each other for 3 years!!) 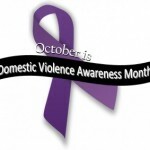 because although I'm not a victim of domestic violence, 1 in 4 women is and my best friend is one of them. She doesn't have to walk this road on her own.